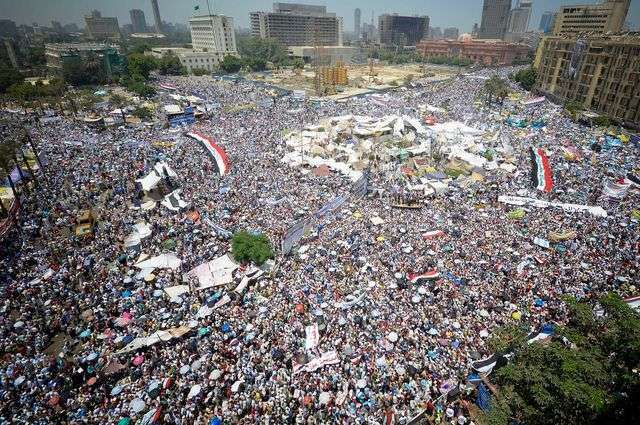 The massive Arab Spring protests that began in late December 2010 and spread from North Africa to the Middle East generated huge crowds and had quick and profound effects—including the overthrow of Egyptian President Hosni Mubarak, who had held a firm grip on the country for decades. Was this the work of people at the core of networks trying for years to create such a movement? Not according to research by Zachary Steinert-Threlkeld, assistant professor of public policy at the UCLA Luskin School of Public Affairs. In a paper published in American Political Science Review, Steinert-Threlkeld argues that individuals not central to a social network may be more responsible for generating collective action and driving protest than those at the center. Steinert-Threlkeld calls his theory of the periphery's ability to mobilize "spontaneous collective action." "Protests occur as a result of decentralized coordination of individuals, and this coordination helps explain fluctuating levels of protest," Steinert-Threlkeld wrote. Although not intended to explain the Arab Spring, Steinert-Threlkeld's paper presents the first large-scale, systematic evidence of how individuals behaved in each country. Unlike simple models such as disease contagion or transmission of news, which need only one exposure to infect or inform the next individual, the spreading of protests is more complex, making it less certain, said Steinert-Threlkeld, who teaches courses on these topics at the undergraduate and graduate levels at UCLA Luskin. "Having someone tell you, 'Hey, I'm going to protest tomorrow' is much less impactful than having multiple people tell you they are protesting tomorrow," he said. Large groups of people, as opposed to a few central individuals, are able to discuss "where to go, how to get there, when to go," as well as what is going on once there, Steinert-Threlkeld added. In addition, individuals debating whether or not to protest must receive a credible signal that large numbers of people are protesting. "Protests are a complex contagion phenomenon because increasing participation makes others more likely to join," Steinert-Threlkeld said, pointing out that because more individuals are on the periphery than in the core of a network, protest is more likely to occur where the larger group is located. "The decision to participate in a protest appears to be driven by normal people taking cues from each other, not from elites." In testing his theory, Steinert-Threlkeld took advantage of the Integrated Conflict Early Warning System, a dataset of daily protests across 16 countries in the Middle East and North Africa during 14 months in 2010 and 2011. He then combined the dataset with geocoded, individual-level communications (nearly 14 million tweets from the same period), to measure the numbers of connections of each person. "These 13,754,988 tweets show what was being said, when it was being said, where and how many connections each tweet author had," he reported in the study. "Combining these datasets and using a wide range of models and operationalizations, mass mobilization is shown to occur through peripheral individuals." Said Steinert-Threlkeld: "Egypt's January 25th protests surprised everyone—activists, bystanders and state authorities—with its large mobilization and brief occupation of Tahrir Square." He added that many Muslim Brotherhood leaders were summarily jailed—even though they did not sanction protests—because the Mubarak regime assumed only they could have mobilized such a crowd. "This paper demonstrates the contributions big data can make to understanding processes of social influence in social networks," he said. 'Normal' people elected Adolf Hitler and Donald Trump too. Normal is clearly quite a wide category.